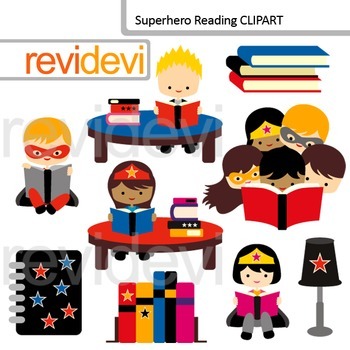 Superhero reading clip art includes 9 cute graphics. Boys and girls reading, books, and a table lamp. Great for ELA or library themed projects. Cute clip art set for teachers and educators. Great resource for any school and classroom projects such as for creating bulletin board, printable, worksheet, classroom decor, craft materials, activities and games, and for more educational and fun projects. - Each clipart saved separately in JPG format, 300 dpi with white background.